This is one of the ships that I couldn’t wait to add to my collection. 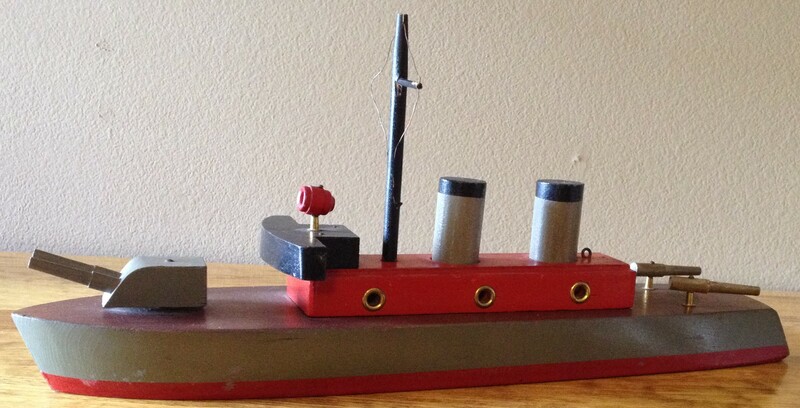 The ship measures 16″ x 4″ and is very solidly built. Jacrim started the Tom Thumb Toys line in 1929 and it ended in 1934 with the dissolving of the company. So with only a five-year window, that closed over eighty years ago, in which these ships could have been produced they definitely fall into the rare category. As for a model number at this point I do not know but two invoices from 1931 mention three Jacrim battleships, a 193, 194 and 206. Looking at the construction of this ship you can see many features that would appear on later ships produced by Keystone. The hull is virtually the same except that the deck is eased into rounded corners at the stern. The rear guns and the front turret are slightly larger in proportion to later ones but shaped the same. The bridge is simple but does appear on at least one Keystone ship about ten years later. 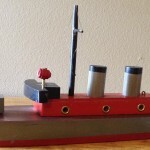 Overall this ship is better constructed with brass fitting as opposed to paint or decals, the stacks sit down into the cabin instead of being nailed to it and the mast has wire lines instead of string. I also find it interesting that the hull was painted and then varnished to protect it from water. I have not seen this on the later Keystone ships. I’m so glad to see the ship I sold you found a good home! Thank you for alerting me to your website. I have a feeling I’ll visit here anytime I’m doing research on Keystone products! I agree that this ship, while perhaps not as “exciting” as some of it’s contemporaries, has a certain simple elegance in it’s design and finishing that looks great! I feel it’s one of my favorites, as well, and hope you’ll enjoy it for years to come!! Keep finding toys as nice as this one and you’ll find them listed here.